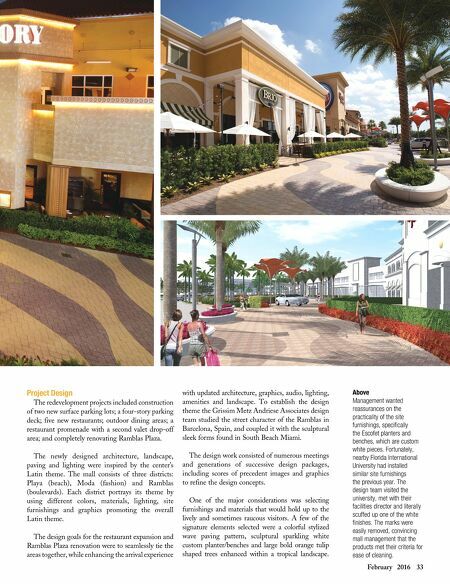 32 Landscape Architect and Specifier News Dolphin Mall is Miami-Dade County's largest retail venue and entertainment center. Miami- Dade County (pop. 2,662,874), the southeastern most county on the U.S. mainland, encompasses 34 cities in the Miami-Fort Lauderdale- West Palm Beach metro area. The mall was originally built in 2001, but has continued to expand each year to currently accommodate more than 240 outlet stores. In addition to shopping, the mall offers many entertainment options. One of the draws is Ramblas Plaza and stage, a central outdoor space flanked by seven restaurants and a daiquiri bar positioned at the north end. Weekly entertainment events take place on the stage, adding to the festive environment of the mall. Over 36 million people come to the mall every year to shop, dine and be entertained. The attendance has increased each year, proving the mall continues to be a popular destination for locals and a draw for tourists. The revenue generated by the valet vehicle drop-off alone is over $1 million a year. Because of the consistent annual growth in visitors to the mall, parking capacity was exceeded on most weekends. It was clear that upgrades were necessary to maintain Dolphin Mall as a leading retail venue. The redevelopment projects began in January 2014, and were completed in the fall of 2015. 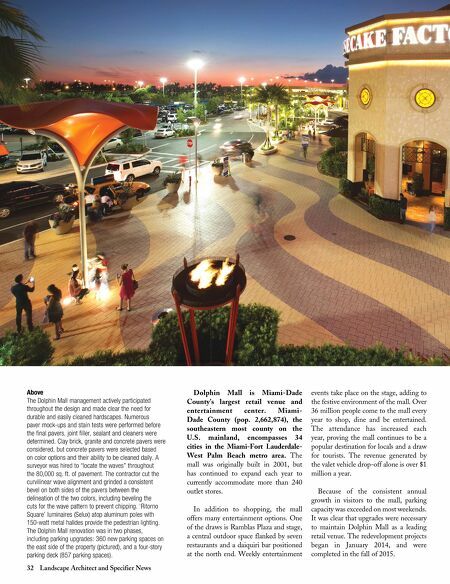 Above The Dolphin Mall management actively participated throughout the design and made clear the need for durable and easily cleaned hardscapes. Numerous paver mock-ups and stain tests were performed before the final pavers, joint filler, sealant and cleaners were determined. Clay brick, granite and concrete pavers were considered, but concrete pavers were selected based on color options and their ability to be cleaned daily. A surveyor was hired to "locate the waves" throughout the 80,000 sq. ft. of pavement. The contractor cut the curvilinear wave alignment and grinded a consistent bevel on both sides of the pavers between the delineation of the two colors, including beveling the cuts for the wave pattern to prevent chipping. 'Ritorno Square' luminaires (Selux) atop aluminum poles with 150-watt metal halides provide the pedestrian lighting. The Dolphin Mall renovation was in two phases, including parking upgrades: 360 new parking spaces on the east side of the property (pictured), and a four-story parking deck (857 parking spaces).